MFFM’s mission is to cultivate a vibrant, sustainable farmers’ market community as a vital part of Maine’s local food network. The Federation works with farmers, consumers, and communities to make wholesome, locally-grown foods available to all residents, to educate consumers about food resources, and to support farm viability. 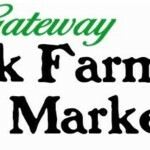 The Maine Department of Agriculture (now known as the Department of Agriculture, Conservation, and Forestry) took initial steps to organize a farmers’ market association beginning in the late 1980s. 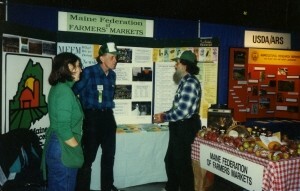 In the spring of 1991, farmers’ market members from a number of key markets pulled together and officially organized the Maine Federation of Farmers’ Markets (MFFM). In the early years, the Federation focused on helping meet the mutual needs of Maine’s farmers’ markets and market members and to promote the establishment and popular use of farmers’ markets in Maine. MFFM was active from 1991-1997, with quiet years to follow until 2010, when interest was revived. Right from the start, the Federation was active in providing educational resources to market farmers and the public. The 1990s were a busy time for the all-volunteer organization, with a quarterly newsletter, collaboration with other organizations to promote local foods, and educational events. The annual Agricultural Trades Show was an important venue, offering MFFM volunteers the chance to interact with thousands of attendees, engaging with the public about the importance of local food and where to find it at a time when the topic was barely beginning to gain widespread attention. 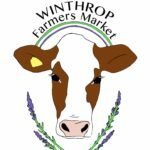 Selling Outdoors, then a print newsletter, spotlighted various markets and included in-depth articles about farmers’ market best practices. * The newsletter was a particularly important resource in those days, when there were few opportunities for market farmers to network and provide mutual support. In 2010 market members around the state began to discuss reviving the Federation in a more active capacity. The Agricultural Trades Show was again a focus for these discussions. Thanks to a USDA Farmers’ Market Promotion Program grant, in 2011 MFFM hired its first full-time staffer, Colleen Hanlon-Smith. As Executive Director, Colleen established an MFFM office in the Mill at Freedom Falls, and rapidly developed effective partnerships with a range of organizations. 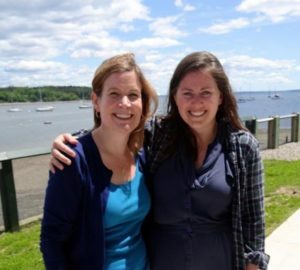 When Colleen decided to focus her attention on direct sales and marketing (moving to a leadership position at the Unity Food Hub), she turned over the reigns of MFFM to Leigh Hallett, who took over as ED in June of 2014. The organization continued to grow in 2015 with the hiring of Emily Buswell as administrative assistant (part time) and Emilie Knight as SNAP Program Coordinator. MFFM is incorporated as a nonprofit with the State of Maine, with a Board of Directors that meets monthly from October through April. 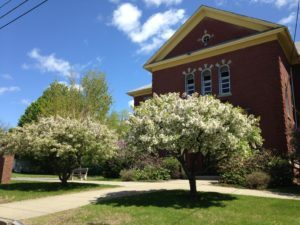 The organization currently has offices in central Maine (Pittsfield), and serves markets all over the state. 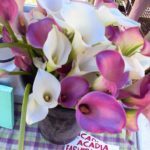 Acadia Farmers’ Market is held Fridays from 3:00pm-6:00pm, June-Late September in Town Hill, Maine. We are set up next to the fire station and playground. On rainy days we are set up inside the VIS hall. Here you’ll find something different every week!